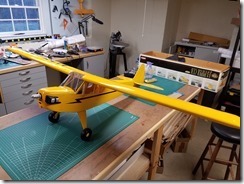 Well I planned to spend an hour or so with the final tweaks to the H9 Cub ARF this weekend, but it turned into quite a bit more work than I thought. I started by checking the balance with my Vanessa balancing rig. 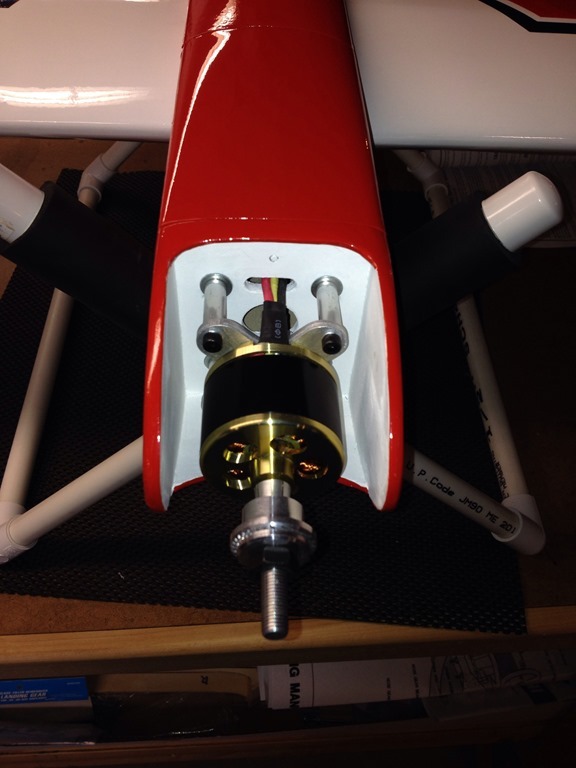 If you have never used a Vanessa rig, it is a simple tool for finding the center of gravity for any plane (I’ll post a bit more about my setup and its use in the future). I turns out that I needed to shift the battery pack as far forward as possible to get close to balance. 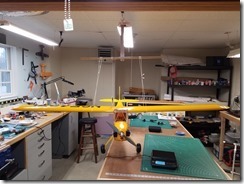 This shouldn’t have been a surprise since the motor and ESC combined together are lighter than the glow engine this plane was designed for. The battery more than makes up for this, but in the location I originally placed it, much of that mass was behind the firewall. No problem, since there is plenty of room in the cowl to slide the pack forward, EXCEPT… I now need to turn the pack around and face the wires towards the back as there is no way to reach the plug inside the cowl. No problem, EXCEPT… the battery wires from the ESC don’t quite reach far enough to connect with the battery. So, now everything has to come apart so that I can add about 1-1/2 inches to the ESC battery wires. I do realize that is typically never a good idea to lengthen the battery to ESC wires, but 1-1/2 inches should not be much of a problem and the total wire length from ESC solder point to battery connection at the pack is still only about 8-1/2 inches (anything over 12 inches typically requires additional capacitors to be added). Everything back together and I try the balance again. It is much better, but still about 5/16 behind the ideal location. 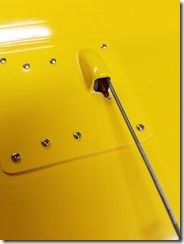 Note: The forward mark in the photo below is the ideal location at 3-1/4 inches behind the leading edge. The mark behind it represents where the plumb bob should point to mark that spot (compensating for the fact that it is offset by 1/2 of the dowel thickness that the plumb bob string is hanging from). It will take about 5 oz or so of additional weight to get the balance on the money. But since the plane is already coming in overweight by about 11 oz, I think I will call this close enough. Note, I was a bit surprised by how much overweight the plane is until I discovered that the combined weight of the battery, motor, ESC are about 8 oz heavier than a glow engine sized for this plane (although I would have that at least some of that would have been offset by eliminating the fuel tank, the receiver battery, and the throttle servo though). So, after the better part of a Saturday afternoon (and a bit of Sunday morning), the balance is finally done. Now just a few minutes to set the control throws. The elevator goes quick enough, as does the rudder (although it is not possible to get the full travel called for without hitting the elevator, reconfirming that this older ARF is not at all up to today’s standards). 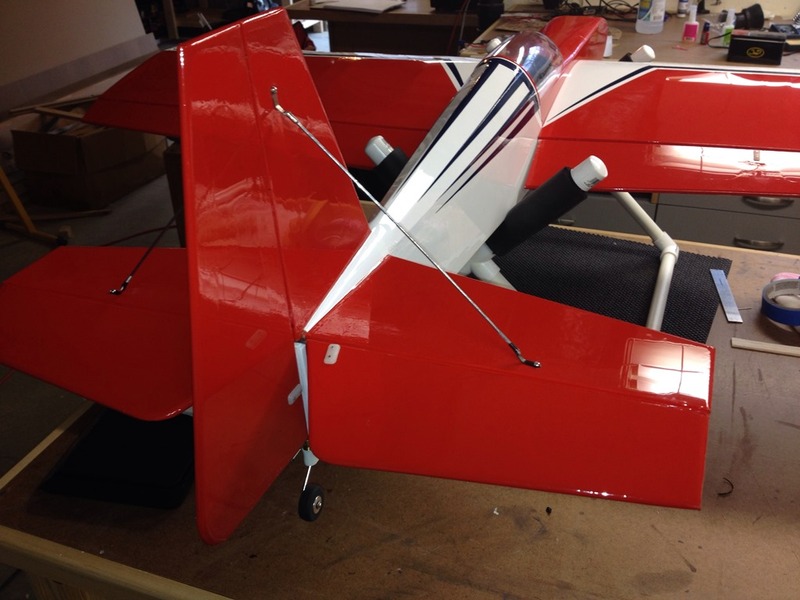 The ailerons however are another story. 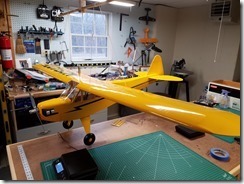 The ailerons must be set with a differential throw to prevent severe adverse yaw tendency inherent to both full size as well as model Cubs, with a greater down aileron throw vs up. 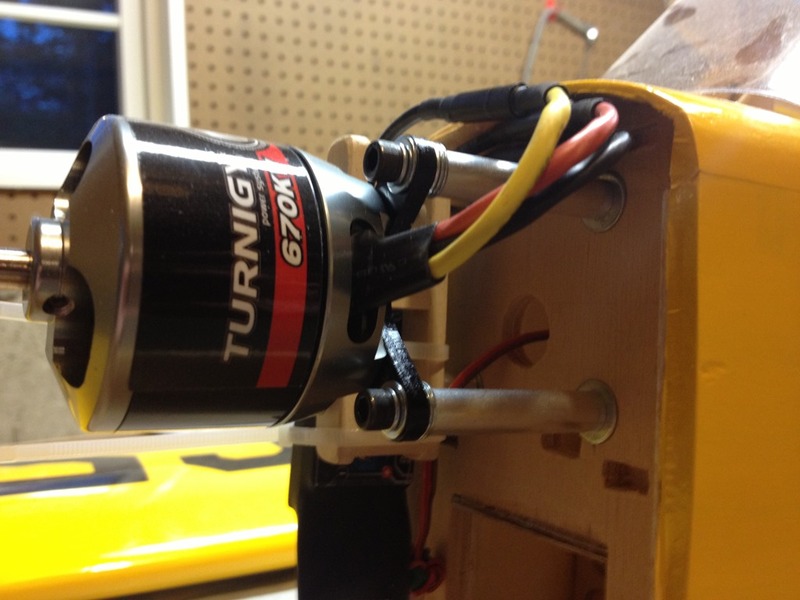 No problem, I installed the servo arms at an offset angle (as called for in the manual) which will build in the differential. 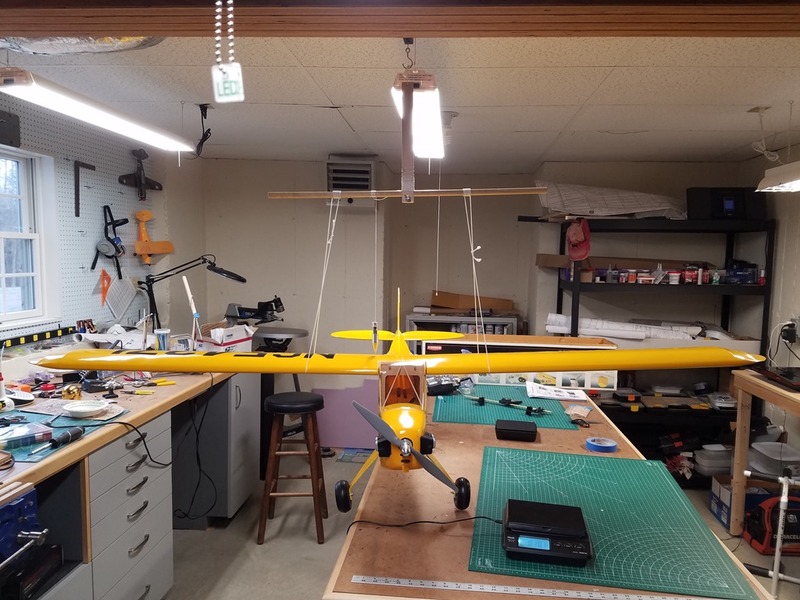 In addition, I am using a 6 channel receiver with a separate channel for each aileron, allowing me to fine tune the travel for each. EXCEPT… at full down aileron throw, the pushrods are binding against the mounting hatch (did I mention that the quality of this ARF). 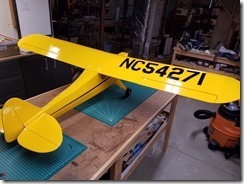 This turned into another lengthy trial and error project of trimming the aileron hatch, adjusting the initial angle of the servo arms, and adjusting the travel limits separately for up and down motion for each aileron. Nothing extraordinary complicated, but time time consuming. You can see in the photo below the notch that needed to be cut in the hatch to allow full pushrod travel without binding. At this point, I am calling it done! 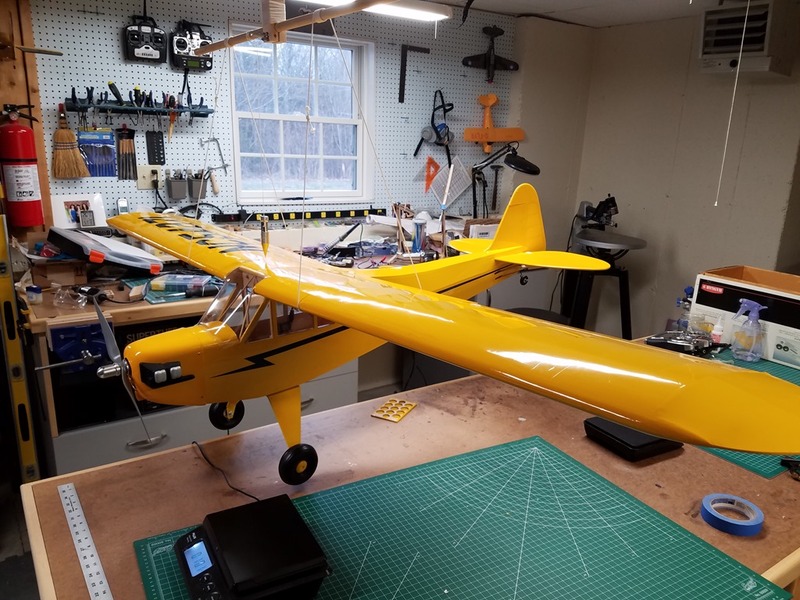 I’ll give here a good once over to make sure everything is secure and all fasteners are tightened up before taking here out for a maiden, but I am definitely getting tired of fussing with this ARF (I guess I got what I paid for!). 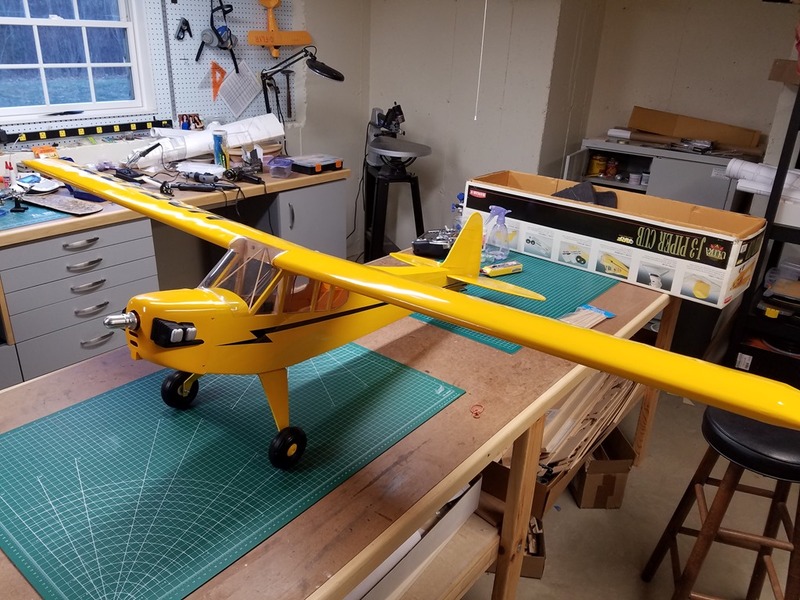 Several years back, I picked up and older Hanger 9 80” Cub ARF. It was unassembled, and all the parts were there, but in truth, it could best be called fair condition. The covering was badly wrinkled, the plastic windscreen was a bit dented, and the fiberglass cowl had a crack in the bottom. But the price was right, so I thought I’d give it go. Compared to newer ARFs, this was quite crude. 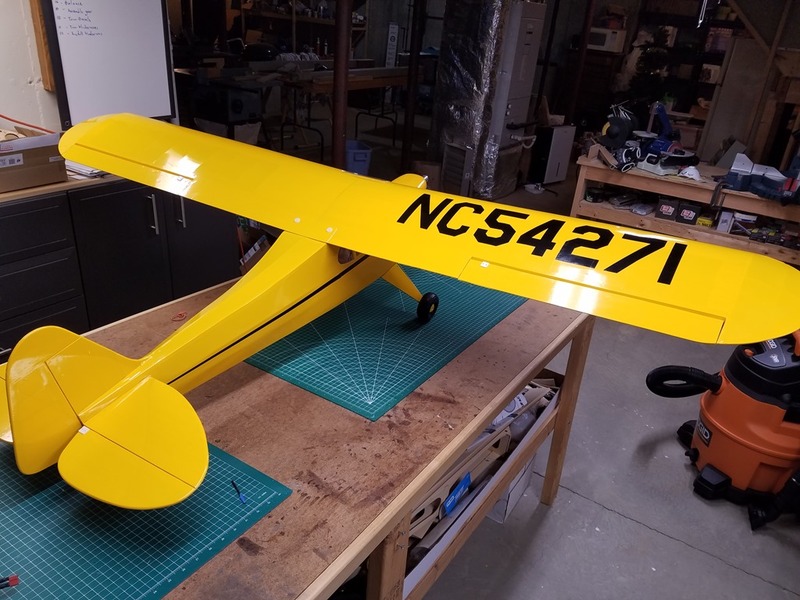 The control surface needed to be hinged, the wing mounting dowels and bolts needed to be drilled, and all the clear parts cut out, trimmed, and installed. The dummy engine bits were just white vacuum formed plastic and they too needed to be cut, trimmed, glued to the cowl, and painted. 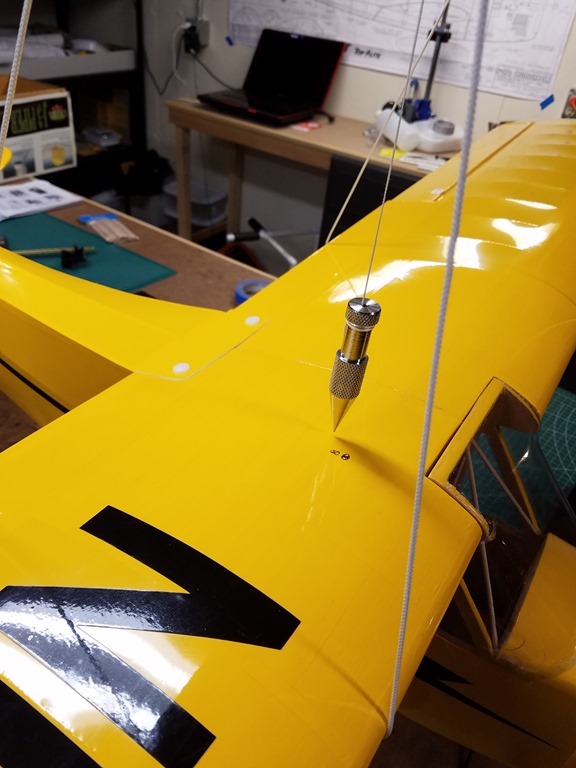 Pushrods needed to be assembled from balsa dowels and piano wire, and even the tailwheel wire needed to be bent to shape from straight stock piano wire. 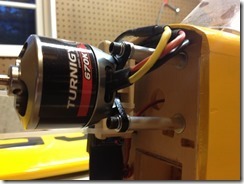 I started picking away at it as a fill in project, and (of course) converted it to electric power, using a Turnigy G46. 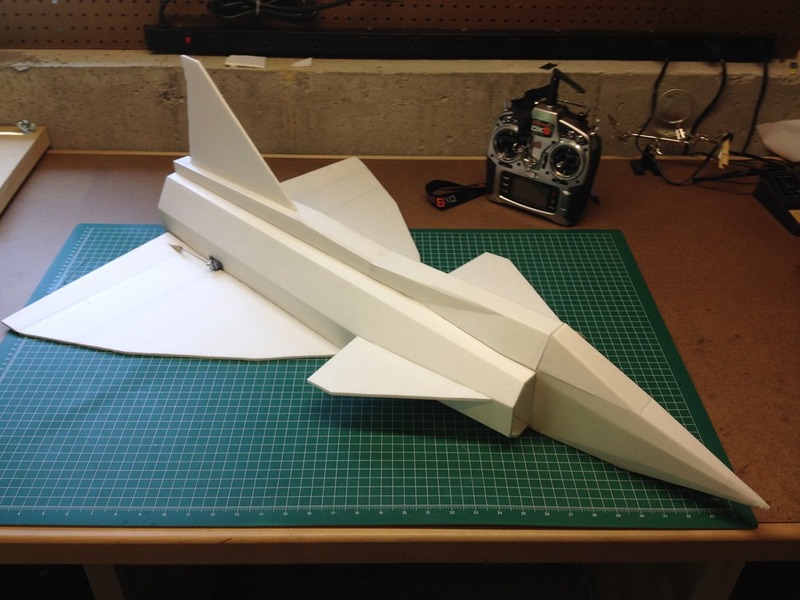 There are some scale details I have yet to add (like non-functional wing struts), but she is finally about ready to fly. Not too much to look at, but I am hoping she will be a good flyer. Looking forward to some warmer (and drier) weather to try her out!